a circle of diameter 60mm. 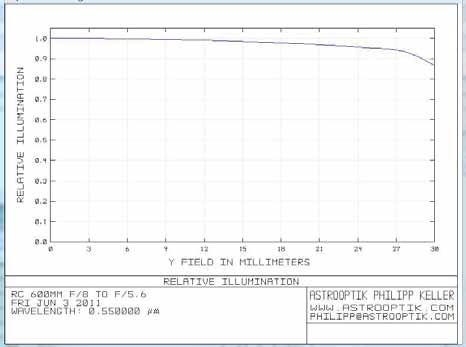 - Optimized for a bandwidth of 400nm to >700nm. - OAL (over-all length) = approximately 75mm. CCD focal plane behind rear surface of cell. The ASA 0.84X 4" Ritchey-Chretien Reducer Corrector will improve your images from your Ritchey-Chretien telescope, by eliminating both coma and field curvature problems! This corrector lens is designed for use on R-C telescopes having an aperture of 0.4meter (15.75") or larger, and an f/number of f/8 or slower. 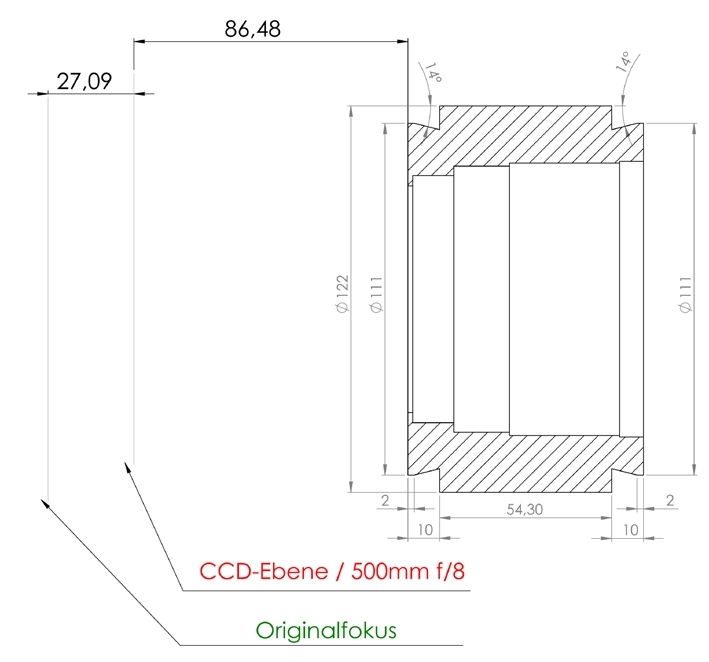 This Reducer Corrector provides a 4" aperture and it's optimized for full-format CCD arrays up to 36.8mm x 36.8mm (Kodak KAF-16803 CCD). This corrector is almost free of vignetting, and can be used with detector arrays requiring somewhat larger circular coverage, however one would expect some minor loss of performance. 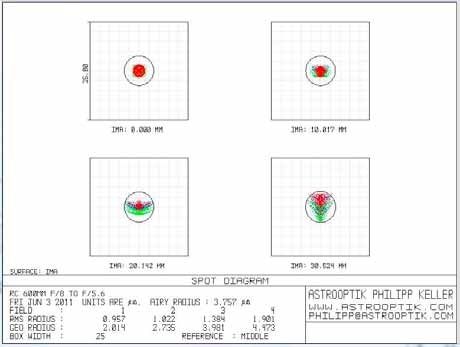 This corrector lens is optimized for a bandwidth of 400nm to >700nm, and every lens used in the corrector is measured to verify its surface radius & thickness, before it is used in an ASA corrector system. Testing has shown that using this corrector with your ASA R-C telescope will produce stellar images which are as tight and round, across the useful field, as any enhanced optical telescope. 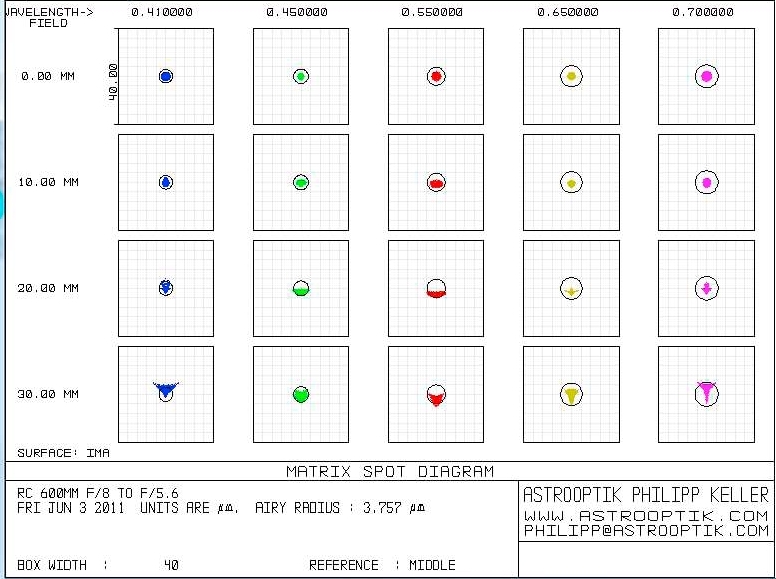 The results are pinpoint stars from the side all the way into the center of the image. 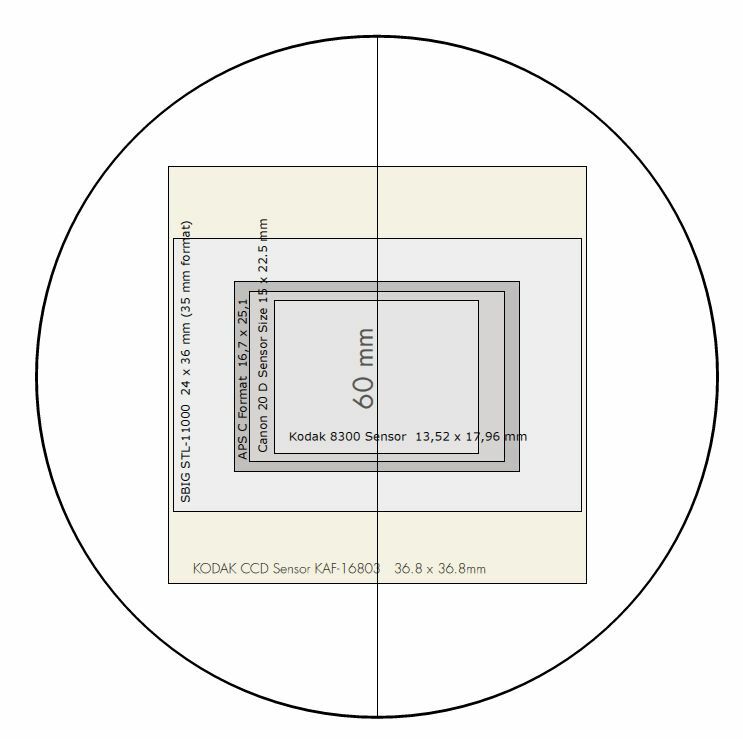 The 4RCKORRR reducer lens will reduce the inherent focal length by a factor of 0.84X. 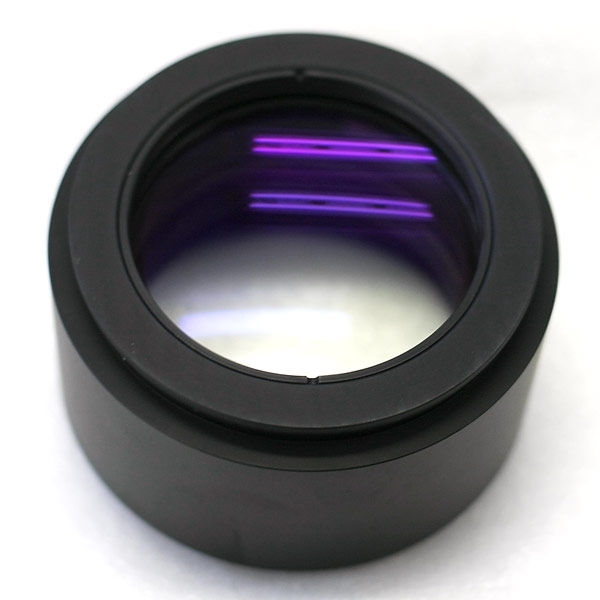 This lens has a field coverage of 60mm, which will more than cover the entire array of a Kodak KAF-16803 CCD detector. The back focus of approx. 86.5mm is sufficient to allow for using an off-axis guider or filter wheel with your detector system. Designed by ASA physicist Philipp Keller. Entrance aperture = 4"; suitable for use on an f/8 system or slower. No rear flange is used in this design. 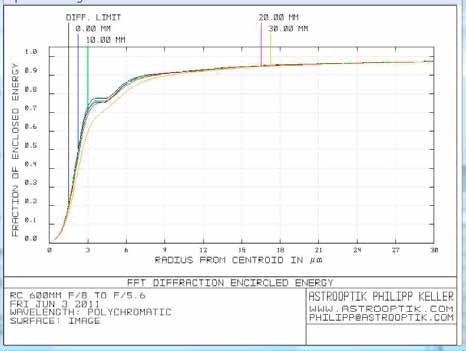 FFD (Flange focal distance) = Location of CCD plane behind "flange," in this case, the rear surface of lens cell.